Our first Alumni Spotlight of the school year features Chad Payne, a 2016 graduate who studied Strategic Management and Business Economics & Public Policy in Wharton! Since graduating, Chad has started working for A.T. Kearny Inc., a global management consulting firm in New York City. Through his time at the firm, Chad has had the opportunity to work on various projects focused on strategy for domestic and international retail, finance, and healthcare clients. In the near future Chad looks forward to traveling and exploring new countries and cultures, developing new relationship and building upon his current relationships, and continuing to learn both in his work and in everyday life. Outside of work, Chad has furthered his passion for health and fitness through refining his diet and incorporating meditation and mindfulness into his everyday schedule. During his time at Penn, Chad was very involved in the Penn community, contributing to organizations such as the Black Wharton Undergraduate Association, Wharton Ambassadors, and Wharton Peer Advising Fellows, just to name a few. Most impactful of these experiences was being a mentor through Wharton and BSL and being a mentee to others within BWUA or AAMBAA. These experiences constantly humbled, inspired, and challenged him, helping to positively shape his Penn experience. As he looks back, Chad would advise current students to focus on the long term, not just the next two years, and to not compare themselves with others as success comes in many different shapes and sizes. In thinking about the relationships he’s been able to forge at Penn and within BWUA, Chad notes that maintaining as many relationships as possible is important. He constantly runs into BWUA alumni while living in New York and even at the airport when he’s traveling. The mentors he’s had through BWUA have helped him in various ways, from starting his career off on the right foot to small things like helping him find a great barber in the city. If you would like to learn more about Chad or get in contact with him, please contact our current Alumni Chair, Dawit Wondimagegn. The Howard E. Mitchell Memorial Conference is one of a few premier networking events on the campus of the University of Pennsylvania, established in honor and remembrance of the Wharton School’s second tenured African-American Professor, Howard E. Mitchell. Mitchell was a scholar in Management and a strong advocate for corporate responsibility and diversity in the workplace. This conference was created to reflect not only his goals and philosophy, but also to invigorate the networks between students of color, alumni, and contacts within our industry-leading sponsors. This year's conference theme is “Taking Control: Empowering Black Professionals for the Future,” and we will be fortunate enough to have the extraordinary Ms. Grace Vandecruze, as our keynote speaker in addition to our wonderful additional speakers. Ms. Vandecruze is the Founder and Managing Director of Grace Global Capital, LLC., a firm specializing in financial advisory. The 2018 H.E.M.M. Conference will begin on Thursday, September 13th, at 7:30 p.m. and run through Friday, September 14th, 3:00 p.m. Admission to the conference is free with registration required. RSVP for the conference here. Let's continue to make the most of this summer! We hope you all have been having a great summer! Since many of you are probably halfway through with your internships, we wanted to send over some quick words of advice and tips to help you continue to succeed for the summer and hopefully get that return offer. Continue to ask intelligent questions: As an intern, your bosses know that you will not have all the answers or know everything no matter how long you have worked on a project. Therefore, it is important to stay curious and ask employees questions about their work, their journey to the firm, and their own passions. Ask team members for coffee or lunch: You are working with incredibly smart, interesting, and accomplished individuals, take the time to get to know them and let them get to know you. It is never too late to meet someone new. Take notes: Whether it is a meeting with one other individual or teaching session with your internship class, show that you are engaged by making note of important comments and interesting insights. Acquire feedback: Although many of you probably have formal midterm reviews, ask for feedback from your boss and other colleagues in informal settings. This will show that you are not complacent and are continually seeking to improve yourself, even as the internship is only halfway complete. **Remember: Although it is work, your internships are incredible opportunities to take in all your firm has to offer. Enjoy the experience, you earned it! If you ever need any personal advice, please feel free to reach out to email us! We would be more than happy to help! Two years ago, we launched the first ever Black Ivy League Business Conference where we brought together over one hundred and fifty Black students from all 8 Ivy League universities for a three day conference filled with senior speakers, corporate sponsors, and networking opportunities. This year, we started BWUA Consulting to deepen our impact in the Philadelphia community. BWUA Consulting is a new branch of our organization formed with the purpose enabling our members to apply what they learn in class by solving the some of the problems faced by Philadelphia businesses today. BWUA Consulting not only helps our members become more prepared for a career in consulting, but it is also the embodiment of our longstanding commitment to our neighboring Philadelphia community. By leveraging what we learn at the University of Pennsylvania, BWUA consultants transform black businesses in Philadelphia and share the knowledge we receive from our Ivy League institution. As Isaiah Washington, the head of the BWUA Consulting effort, puts it “BWUA Consulting specifically targets minority owned businesses in Philadelphia. It is part of our mission to use our skills to uplift the minority community and contribute to economic development within it." BWUA Consulting is made up of twenty-three members. Fifteen students work as consultants and team leaders, directly interacting with local companies. Eight students serve as part of the Consultant Development Committee and help to craft consulting skills workshops for BWUA and BWUA Consulting members to get a better grasp of the skills needed to be a successful consultant. Team leaders especially get to develop a unique skill set. Not only do they have to manage their team, they also get to select what project they want to work on and then try and select team members who fit the specific skills needed by each specific project. Individual consultants also get a unique experience as they get great exposure to consulting and get to learn what life as a consultant entails in a hands-on way. “Before coming to Penn I had no idea what a consulting firm was, and I felt most comfortable turning to Black Wharton and BWUA Consulting to teach me. I’ve learned so much about this side of the business world and gained so much actual experience working as a consultant through BWUA Consulting,” says Nyeem Maloney, a current consultant and Director of Marketing for BWUA. Although it’s still in the early stages of its life, BWUA Consulting has already had an impact on students here on campus and in the community here around Penn. As we continue to grow this mission and deepen our relationship with Philadelphia businesses, we look forward to where our organization will go and look forward to seeing the long-lasting impact it will have on our members and the community. BWUA’s second GBM of the semester “Who Wants to Be a Bwuillionaire” was geared towards teaching members all they needed to know about the on campus recruiting process (OCR). OCR is a campus wide initiative that takes place during the fall semester. It is a time when companies from the banking, consulting, tech, retail, marketing and education industries (to just name a few) recruit students heavily from the junior class and somewhat from all others. Many students feel overwhelmed by the process and so Justine Murray, Historian, Peter Ojo, Freshman Liaison and Kimberly Madauban, Director of Professional Development, sought to dispel some of the scarier myths associated with the phrase as well as highlight the keys needed to successfully navigate the process. The GBM commenced with a quick rundown of what OCR entailed and how to take advantage of PennLink, QuakerNet and the other resources Penn provides. The combination of good food, great people and a rousing game served to transform this GBM from a mere learning session to a memorable and exciting experience. It is our hope that all in attendance learned what they needed to about OCR and, if not, know that they can reach out at any time to anyone on the board as we would love to help all our members successfully navigate this process. 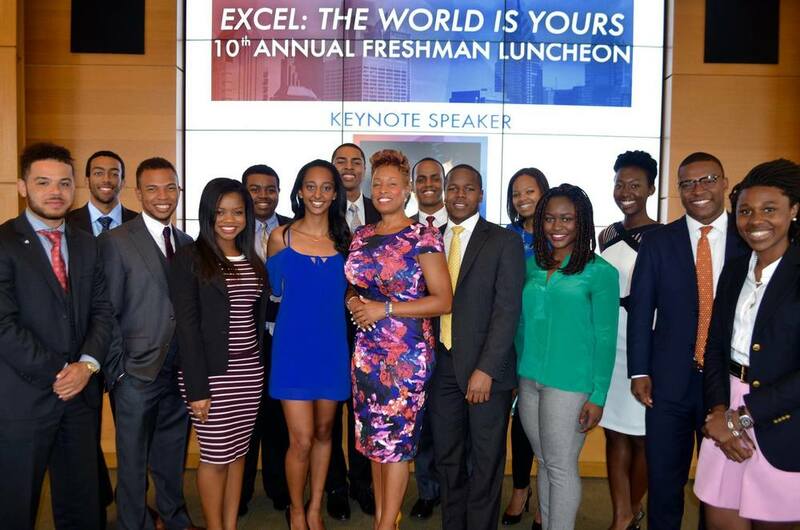 An accomplished lineup of speakers, including NBA Chief Operating Officer Mark Tatum, highlighted the 31st Howard E. Mitchell Memorial (HEMM) Conference, held annually by the Black Wharton Undergraduate Association in honor of Mitchell, Penn’s second black tenured professor. “His teaching career and most of his life was dedicated to corporate responsibility and diversity in the workplace,” said Dawit Gebresellassie, the Vice President of Corporate Development for BWUA and a Wharton junior. The conference allows students, especially minority students in Wharton, to meet other successful people of color in the business world. Tatum delivered the keynote address and stayed over an hour after the conference to take pictures and network with students. During the keynote, Tatum encouraged students to “pursue [their] passion vigorously”, as he talked about how he made it to where he is today. “It is not only about what you’re passionate about and what you are good at but knowing what you are not good at,” he said. New additions to the HEMM conference this year included a social media contest, where students who shared the most on social media with #HEMM2016 won a Wharton or Penn padfolio. Gebresellassie said that the goal of using social media was to make the conference more interactive for attendees. The conference started on Wednesday evening with a two-hour bootcamp, where students learned networking tips and exchanged ideas about what types of questions to ask the professionals that will be at the conference. This year’s conference theme was “Passing the Torch: Cultivating Black Excellence” and included panelists Denise Bailey-Castro, a director at Viacom, Brittney Calloway, CEO of Top Notch Property Solutions and Jason Wiley, vice president of the Philadelphia 76ers. Wiley was not originally expected to speak, but another panelist dropped out last minute. “Despite last minute changes the conference went smoothly,” Gebresellassie said. “We wanted to branch out from just banking and consulting,” Gebresellassie said. The career fair portion of the conference, which took place before the luncheon, featured tech, retail and media companies along with banks and consulting firms. Following the career fair, Wharton Dean Geoffrey Garrett present the two HEMM Scholarship awards. The first was awarded to College freshman Mary Osunlana, while the second was awarded to Wharton sophomore Victoria Brown. In order to keep events running smoothly, Wharton junior, Kayvon Asemani and College and Wharton junior Billy Kacyem, were appointed Co-HEMM Conference Chairs. BWUA also sourced a corporate committee to handle all the necessary “grunt work, ”making calls and sending emails. This committee allowed underclassmen to get involved when they typically would not have the opportunity. “I wanted to help put the HEMM Conference together, to help younger students the way upperclassmen in BWUA helped me,” Kacyem said. Previous BWUA board members attended as recruiters for their current employers. Simon Tesfalul, former BWUA president and a 2016 Wharton graduate said, “This was the best conference I have seen in years.” The conference usually takes place in December. However, with on-campus recruiting moved to the fall, the board members of BWUA decided it would be most beneficial to host the conference early in fall semester. This shift in schedule required board and corporate committee members, and HEMM Conference Co-Chairs to work on putting the conference together during the summer, in order to secure space in the eighth floor of Huntsman Hall. They also had to coordinate with the large firms and companies who attend the companies looking to recruit students. BWUA kicked off their fall activities calendar last Saturday with their annual freshman luncheon. The freshman luncheon was created as a way to introduce freshmen to what BWUA was all about. Additionally, it gives them the opportunity to interact with and hear about the trials and successes of a selected black professional. That person this year was Jonathan Jackson the co-Founder of Blavity. Blavity is “a tech company for forward thinking Black millennial pushing the boundaries of culture and the status quo”. On their site you can find articles and videos written by many black authors speaking to their different experiences as black people in the world today. Jackson regaled the freshmen with stories of his success, the failures he encountered along the way and went on to advise them on how to best take advantage of the next four years. Peter Ojo, freshman liaison, echoed his message and went on to speak about how the board and BWUA as a whole, will be there to help them successfully navigate the next four years. With an amazing speaker, engaged students and delightful food, the luncheon this year served as a stimulating start to what we at BWUA hope will be a semester like no other. Our second GBM of the year, TedX BWUA, gave some of our finest black undergrads, at the forefront of their chosen fields, the opportunity to speak about their different ventures, and how the resources at Penn have aided in their success. Our speakers for the event were, Morgan Brown, Casey Bridgeford, Chaz Smith, Malik, Khalil and Ahmad Jones , Anthony Perry and Mikayla Barnett. Morgan Brown, a sophomore at Penn, has a youtube channel with over 200,000 subscribers. She spoke about the nature of her videos and the following resources at Penn that continue to help her improve her skills as a both a photographer and youtube personality. The BWUA President, Anthony Perry, spoke about his entrepreneurial ventures and how working with other likeminded students on campus can aid in one’s desired success. Mikayla spoke about her passion for creative marketing and entrepreneurship and the path that led her fall in love with these areas of business. Khalil, Ahmad and Malik Jones spoke about their business “Three Triplets Fitness”. Their love for fitness and ability to impress this love upon others inspired their founding and the continuous growth of this venture. Their success has resulted in their being featured on BET as well as partnerships with other prominent fitness groups. Chaz Smith spoke about his love for videography and why he chose this field despite the expectation growing up, that he would do something else in his life. He spoke to the importance of pursuing that which you love despite the expectations of others as that is what will ultimately ensure your success and long term happiness. Our first GBM of the year was geared towards enhancing our general bodies’ awareness of commonly used but sometimes difficult to understand financial terms. Volunteers were placed into teams of five which them went on to face off against each other. Not only did the GBM serve as a great educational experience with delicious food on the side, but, due to its being the first of the year, members got the chance to catch up with each other after the winter break. Thanks to all of you who came out to support. We look forward to seeing you at our next event! Lauren C. States is a 2015 Advanced Leadership Initiative Fellow at Harvard University. Previously, States has held numerous executive positions at IBM Corporation, including CTO, Corporate Strategy, VP Strategy and Transformation, VP Technical Sales for IBM’s Software Group. Ms. States is a member of the Executive Leadership Council. She is on the Board of Trustees for International House, New York, on the Advisory Board for Mobiquity Inc. and is the Advisory Board Co-Chair for the Women In Technology Foundation B~STEM Project. She received the Federal 100 Award in 2012 and was recognized at the Black Engineer of the Year Conference with the Pioneer Award in 2013. In 2014, she was inducted into the Women in Technology International Hall of Fame. GetVoIP recognized States as one of the most 25 Influential Women in Cloud in March 2015. Black Wharton Undergraduate Association had a chance to talk to Lauren about her career in the tech industry. Black Wharton: You're very accomplished. Can you just tell us a little more about your work experience? Lauren: Thanks! I spent over 35 years in the tech industry working for IBM. I really enjoyed the experience and would describe my path as a portfolio career. I worked across the business in key senior leadership positions including technology, strategy, transformation, sales and talent development. Some of my roles included Chief Technology Office in the company’s corporate strategy function, Vice President overseeing the software business’s 5,000+ technical sales force and Vice President on a company wide-transformation, responsible for skills development of our 38,000+ global sales force. I’m currently an Advanced Leadership Initiative Fellow at Harvard University. The program is designed for executives who want to apply their experience to significant issues such as education, public health, environmental issues, or other ways to impact society. I’m focused on math literacy and improving the pathways for minority students to participate in STEM related careers. Black Wharton: Black Wharton is officially recognized as beginning in 1985. What was the organization like during your undergraduate years? Lauren: We were very enthusiastic about our futures and wanted to support each other. We had the opportunity to visit several companies including Chase Manhattan Bank in New York City. It was all very exciting! Black Wharton: How did you get into the tech industry as a Wharton student? Lauren: My father encouraged me to attend Wharton because I was very good at math. I started out in accounting, but had the opportunity to take a programming class and fell in love with coding. I decided to major in Decision Sciences and developed strong critical thinking and analytical skills. When IBM came on campus recruiting, I was interested in their Systems Engineering job. They made an offer and I started in the Manhattan office. 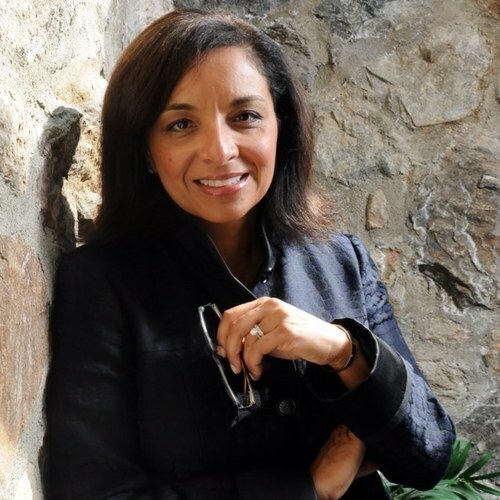 Black Wharton: What was it like being a woman of color in the tech industry in those days? Lauren: You know, I never saw that as an issue. Growing up, I had always been one of a kind or one of a few. I saw the tech industry as an opportunity for growth. My philosophy was to consistently deliver strong business performance. Sure, sometimes I found myself in inequitable situations, but in the long run consistent performance was the measure for my success. I’m proud of the contribution I’ve made to the industry and grateful for the recognition I’ve received. I plan to use my success as a platform to support and encourage others. There is incredible opportunity in the tech industry and I want to inspire young people to participate. The Penn-pire, a conglomerate of academic, social, professional, and personal challenges, was broken down into palatable bits and pieces at this October's GBM. A friendly competition of BWUA's own rendition of The Game of Life revealed solutions to challenges and obstacles facing Penn students across all four years. Director of Marketing Mikayla Barnett explains the rules of the game to each of the representatives from the freshman, sophomore, junior, and senior classes. The game consisted of five rounds with each round containing four questions, one for each representative. Each representative was permitted to consult the rest of their class on the correct answer to each question. Every correct answer won one step forward and every incorrect answer held the player in his or her current position. Game question topics included: Penn's academic and professional resources, time management tips and priority assessment advice. These topics applied to semester phases in the life of each freshman, sophomore, junior, and senior student. Questions of the "What would you do?" variety elicited personal responses from members of each class. Most of these responses were correct according to the guide to navigating the Penn-pire and others were close second best options. The outstanding performance of each class and their respective representatives forced the game into a tie-break round. The first representative to give two out of three correct responses would win the game. The senior class rep seemed to be the most excited to answer this first tie-break question while Sophomore rep, Amir Baiyina HEMM Co-Chair, took a more subdued pensive approach. The question is: Who won??? The sophomores pulled off a fantastic win and got to go home with BWUA long-sleeved shirts and laptop bags! Thank you to all attendees and participants for your amazing performance at this month's GBM! Make sure you share all of the insights you gained from BWUA's lesson in Navigating the Penn-pire! 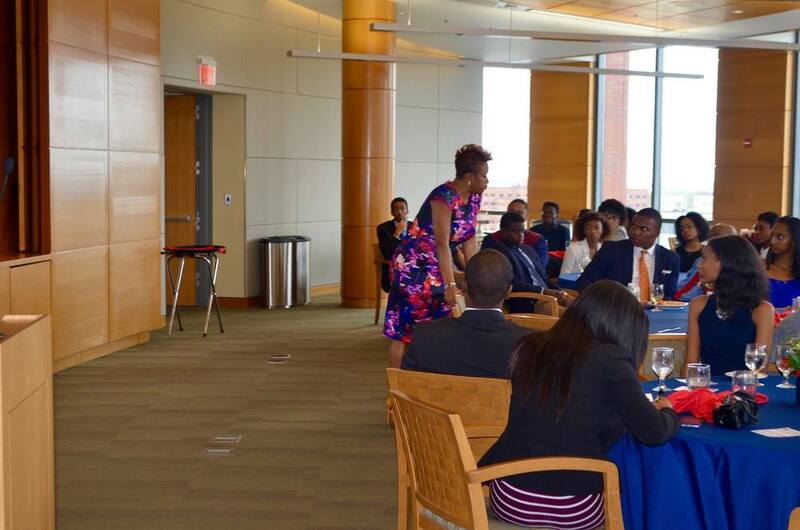 On September 12th the Black Wharton Undergraduate Association hosted the 10th Annual Freshman Luncheon. Keynote speaker, Kimberly S. Reed, Managing Partner and CEO of Reed Development Group inspired the incoming class of freshmen with words of encouragement, perseverance, and vision for the future. Preceding the keynote, guest speaker Vice Dean Lori Rosenkopf gave pertinent words of advice and emphasized the importance of pursuing growth through networking within organizations like BWUA. Vice Dean Lori Rosenkopf educates freshmen on the multiple resources they have at their fingertips to help them succeed at Penn. It's a journey from start to finish and freshmen got plenty of tips from the Vice Dean on how to navigate their lives at Penn. "Walk, think, talk like the person you want to become," keynote, Kim Reed instructs the freshmen class to be confident individuals unafraid to work their passion and purpose. She asserts that all of your talent and education alone create value but, it is your network, your relationships which are attached to your opportunities that allow you to capitalize on your potential and maximize your growth. In other words "your network is equal to your net worth." Foodwerx of Cherry Hill, New Jersey catered the luncheon. The cuisine was exquisite! Thank you for giving us the tools to paint the splendid canvas that holds our future, Kim. You are an inspiring and passionate woman and we genuinely appreciate the time you spent with us and the professional and personal wisdom you imparted. BWUA started the year off right with the first GBM of the semester and the year by welcoming the new class of freshman with words of guidance and support. Triston Francis W '12, former BWUA President and a panel of upperclassmen provided crucial academic and professional advice in their responses to questions from attendees. Black Wharton held its final GBM of the year this month focused on preparing members for their entrance into the workplace this summer on internships and full-time work using 10 quick commandments. After the GBM we sent off our BWUA Class of 2015 Seniors! Director of Alumni Relations Fola Onifade and Director of Membership Sydney Williams dove right in starting off the GBM with their Ten Commandments for entering the workplace. Members got the chance to practice Commandment #1 during the team pitch competition. Teams had to think quickly on their feet to come up with presentations on preexisting companies and pitches for new ones which they produced themselves. The judges and audience members had plenty of questions for our lucky presenters who all did a fantastic job pitching their ideas! At the end of the GBM it was only right to give our bright senior BWUA board members a proper sendoff. CONGRATULATIONS CLASS OF 2015!!!! We wish you all of the success and happiness that you deserve. You will be missed. Thank you for everything you have done for Black Wharton and the greater Penn community! This month, BWUA hosted its second GBM of the semester geared toward educating the members of BWUA about potential internships, minority programs, and study abroad opportunities. Members had the chance to speak to upperclassmen about their experiences at various internships, programs they've been involved in, and life studying abroad. BWUA members engaging with upperclassmen representatives all over the room! Director of Alumni Relations, Fola Onifade, talking to a few underclassmen about her experience studying abroad in France during Penn's Summer in Tours study abroad program. All eyes on Josh Richardson W'16! Members gather around to hear some great advice on the finance industry and internships. Federal Donuts' fried chicken and donuts was delicious! BWUA kicked off the semester with a Jeopardy themed GBM this past Tuesday. BWUA Jeopardy categories ranged from from Media and Entertainment to BWUA Resources. The last Jeopardy clue honored the organization's anniversary this year: " BWUA was founded in this year. The current year marks this anniversary for the club." Answer: 1985. 30th Anniversary. President Simon Tesfalul and VP of Corporate Development Jamol Williams chat before beginning the first round of BWUA Jeopardy. What is Career Services? Career Services is an excellent resource for all Penn students looking to find internship opportunities, get resume help, and even interviewing advice. Black Wharton members were quite enthusiastic about BWUA Jeopardy. Freshman Shawn Simmons got a little more excited than we expected. We think it was all for the snazzy BWUA t-shirt. The Proud Family themed game featured teams Suga, Gross, and Penny. Team Penny, pictured above, took an early lead and won the game, earning themselves some cool BWUA t-shirts. Congratulations Team Penny! At the start of this month's GBM, board members introduced themselves and presented committees. Mikayla Barnett, Director of Marketing, and Jamol Williams, Vice President of Corporate Development, presented the opportunity for members to join the Marketing and Corporate committees. In addition to these two committees, members are free to join the Community Service Committee led by Rashan Prailow, Director of Community Service and the Freshman Committee led by Freshman Liason, Alexis Malcolm. Baltimore Crab & Seafood was served. This year's HEMM Conference, entitled "Breaking Boundaries: Expanding Our Vision for the Future brought together over 200 students, more than 30 alumni, and 26 sponsors to collaborate, network and learn. Leading up to the Conference, Black Wharton held for the first time, a weeklong crash course in all things HEMM called BWUA Boot Camp. During this week, members learned the do's and don't's of business professional attire, and the art of networking from Barbara Roche. Members were also given the opportunity to get one-on-one resume feedback by meeting with board members of Black Wharton and Wharton Alliance. On Thursday evening, students and alumni gathered over dessert at the Alumni Reception. Students were given the opportunity to mingle and network with past Black Wharton alums from various fields of expertise including consulting, finance and entrepreneurship. 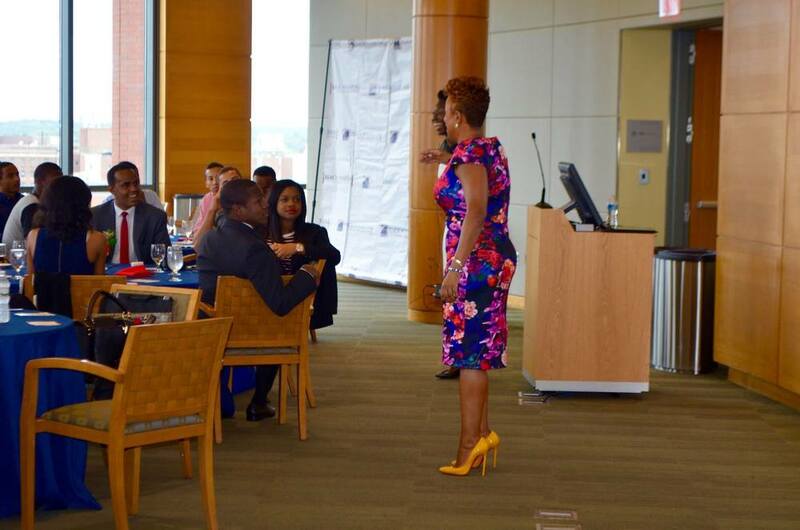 The reception culminated in the announcement of a new partnership between Black Wharton and AdviceShare — platform that connects students seeking specific career or collegiate advice from alumni. Friday featured a two and a half hour career fair followed by an Executive discussion panel in Huntsman Hall. Black Wharton sponsors from banks like Bank of America to retailers like UnderArmour to nonprofits such as Teach for America were present. The panel included representatives from IBM, J.P. Morgan, Bloomingdales and Morgan Stanley. The conference ended with a luncheon where Chief Growth Office of Bad Boy Records Worldwide Entertainment Group Derek Ferguson served as the keynote speaker. After the presentation of this year's HEMM Scholarship recipients (one freshman, one upperclassman) by Wharton Dean Geoff Garrett, Ferguson spoke of the tremendous opportunities facing today's generation, with ability to rethink and revision the industries of the 20th century. Ferguson spoke to the entrepreneurial passions of attendees, reminding them of its great value. He recalled his dorm room experiences founding media publication Urban Profile, a publication better know by its contemporary name today, Vibe Magazine. Thanks to all those who attended. We look forward to hosting our 30th annual HEMM Conference next year! View the entire photo album here. As we gear up for HEMM 2014, our November GBM focused on one possibly the most crucial part of landing a summer internship or full time job — your resume. Natalie Bernal, a recruiter from the Sponsors for Educational Opportunity or SEO spoke briefly about the do's and don'ts of a good resume. These tips included using strong action verbs, quantifying results, and leaving out high school information that was no longer pertinent. Club members were then given a mock resume filled with several errors that they were asked to identify. Everyone also received a job description with which they were to prep for an interview. Three students volunteered to participate in a mock interview with the goal of tailoring the resume to the particular job. Students were asked: "Walk me through your resume," "Why are you interested in this career?" and "What skills make you a good candidate?". The purpose of the mock interview was to highlight the importance of knowing one's resume inside and out and being able to use it to support your qualifications for a particular job. The volunteers were judged based on their clarity, answers, and posture and the winner received a Wharton pad folio. The student who found the most errors in the mock resume also received a prize. The GBM was meant to get club members thinking about their resumes as recruiting season approaches and more importantly as HEMM nears. Be sure to attend the BWUA Boot Camp leading up to the conference which will take place on December 4th and 5th. On November 12, BWUA members took a trip up to the City to network with BWUA alumni. Among past board members present, three former presidents — Triston Francis, Luzerne McAllister and Paul Ampofo — were in attendance to impart some wise words on current students. The mixer gave students an opportunity to speak with alumni on a personal level while enjoying the elegant atmosphere of the Penn Club. Members found the mixer to be worthwhile, saying it was both informative and inspirational. On Tuesday, October 14, we held our second GBM of the semester. This GBM taught members the benefits and usefulness of LinkedIn as a professional networking tool. We debunked several myths associated with LinkedIn such as "No one is on LinkedIn" and "I only need LinkedIn if I'm looking for a job." Through a text-in survey during the GBM, we found out that a majority of club members were actually already on LinkedIn. Additionally, several board members shared that they created their LinkedIn accounts in their freshman year before the job search became crucial. Many members asked insightful questions about how to best tailor their LinkedIn profiles to companies they were interested in and presenters Avi Crawford and Rashan Prailow shared the importance of joining LinkedIn groups. They also explained that it's okay to connect with recruiters and individuals at companies that you may not be so close to. LinkedIn helps to facilitate such connections. 1.) Complete your profile. This way it shows up when companies Google search you. 2.) Be descriptive. Your LinkedIn is a chance to expand on who you are outside of your resume. 3.) Keep it professional. Have a professional photo to help build your personal brand. 4.) Stay connected. Aim for over 50 connections to grow your network. Throughout the GBM, we took personal photos for club members who wanted to update their LinkedIn profiles. Club members came dressed to take their LinkedIn profiles to the next level.